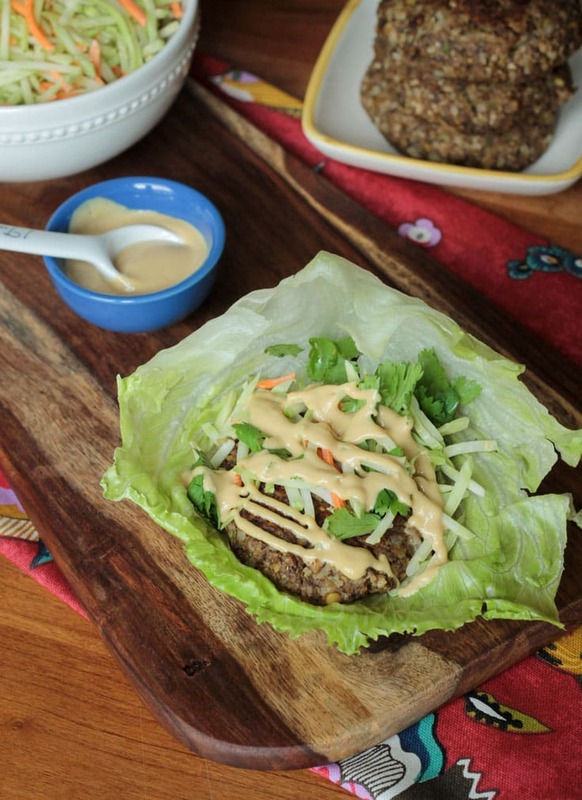 I’ve made these spiced lentil quinoa patties no less than 3 times this past month. I can’t get enough of them. They’re super healthy. And my kids love them too, which is a huge score. As we had them yet again the other night my son said, “Oh, these again?” I was waiting for the eye roll and groan, but he quickly followed it up with, “Yay!”. The spices give such great flavor, but are subtle enough for tiny tastebuds. Served up with a simple tomato cucumber salad and a savory Tahini Yogurt Sauce, this is one delicious meal you will make over and over again. No, it’s not Monday today, but most people could benefit from a few more meatless days in their lives. Why should Monday get all the fun? I have nothing against Taco Tuesday – actually I LOVE Taco Tuesday – and if you do too, then check out my collection of must have taco recipes here. 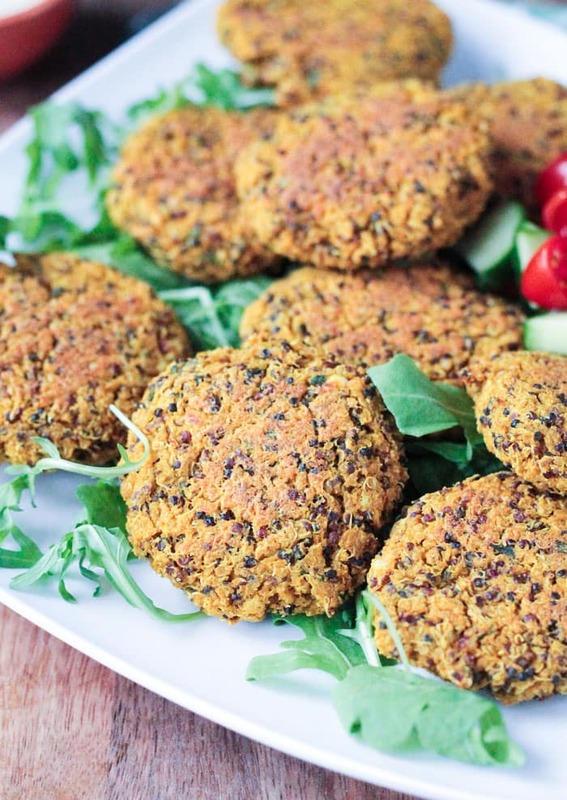 But, these quinoa fritters are a good choice for any night of the week. They take about 45 minutes, but nearly all of that is hands-off time. 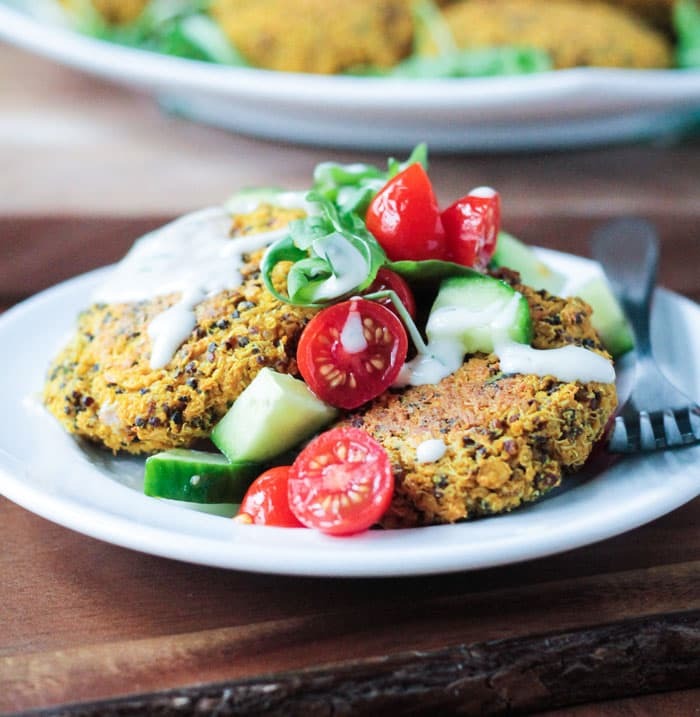 If you have leftover quinoa and lentils or simply want to cook it the night before, these gluten free fritters will come together in no time at all. Turmeric has an earthy flavor with hints of citrus. I find that it pairs exceptionally well with cumin and I’ve used both in this quinoa fritter recipe. I’ve even been drinking it at night in a mug of warm almond milk with cinnamon and cocoa powder. It’s so good! Quinoa is a complete protein, as well as boasting high percentages of manganese, copper, phosphorus, fiber, folate and zinc. Lentils are high in protein and also contain fiber, folate, iron, phosphorus, zinc and potassium. 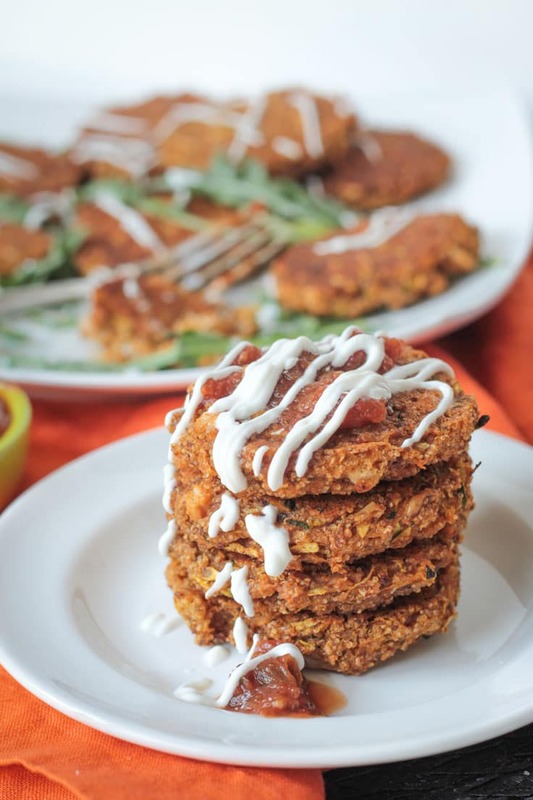 So, if you are indeed worried about your protein intake, serve up a couple of these Red Lentil Quinoa Fritters and relax. What makes this meal really come together is this easy Tahini Yogurt Sauce. It only takes a few ingredients and few minutes to whisk together. My kids even loved dipping their steamed broccoli in it. If you want to eat these vegan fritters on a bun, that would certainly work, just spread the sauce on the bun. Otherwise, I like to serve them up with a little cucumber tomato salad on the side and a drizzle of the Tahini Yogurt Sauce over everything. Make sure to get a little bit of everything in each bite – so good! 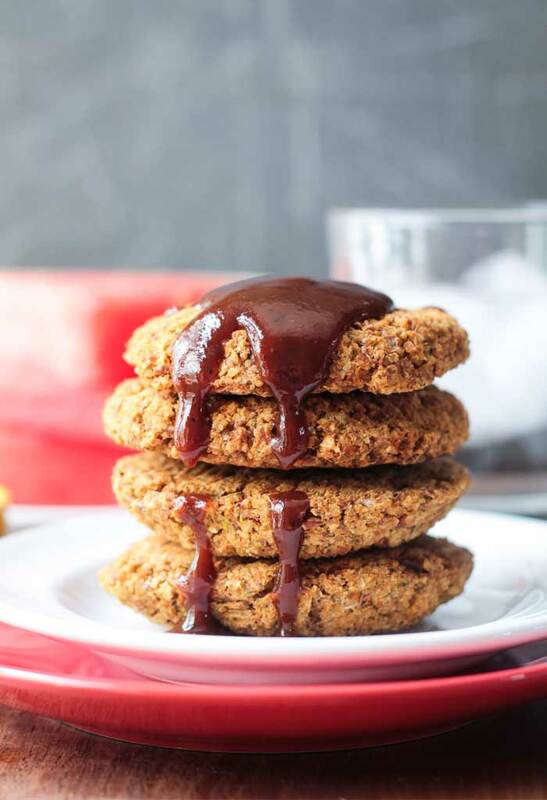 If you like mixing different components of a meal into one perfect bite, then you must try my Millet Black Bean Patties with Pineapple Avocado Salsa and Spicy Chipotle Sauce! Total heaven on a plate right there! 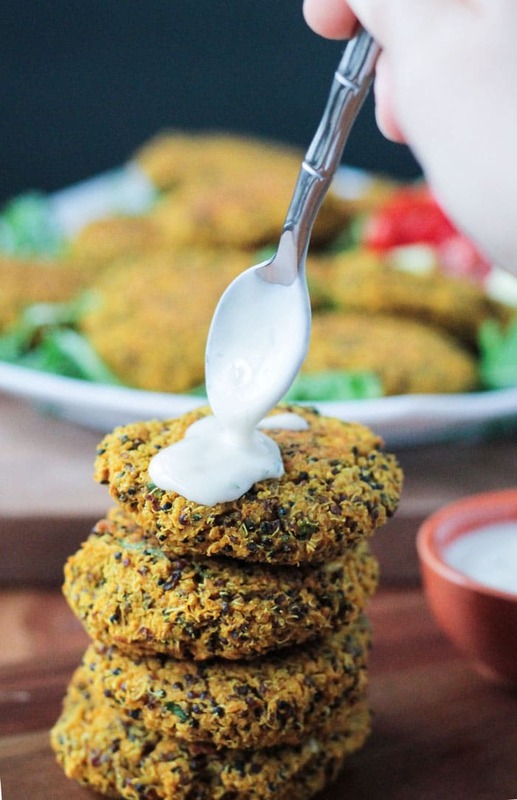 I hope you love these quinoa fritters as much as we do! I love hearing from you guys, so if you give them a try, please come back and leave me a comment below with your feedback and star rating. You can also find me on social media. Be sure to tag @veggie_inspired and #veggieinspired so I’m sure to see it! Enjoy! Rinse and drain the quinoa and lentils. Place in a pot with the broth (or water), cover, and bring to a boil. Turn the heat down to med-low and simmer 15 minutes, stirring occasionally so it doesn't stick to the bottom of your pot. If there is still liquid in the pot, remove the cover and continue to simmer on low for another 3-5 minutes until the liquid is absorbed, stirring as needed to prevent sticking. Set aside to cool while you gather the rest of your ingredients. *You can also use quinoa and lentils that have been cooked ahead of time to save time. Once the quinoa/lentil mixture has cooled a bit, transfer to a large mixing bowl. Add the parsley, tahini, dijon, lemon juice, turmeric, cumin, cinnamon and salt. Stir well to incorporate. Add the cornmeal and chickpea flour and stir again very well. The mixture should easily come together to form patties. It will be slightly sticky, but not wet. If your mixture is too wet, add a little more chickpea flour, 1 tbsp at a time, mixing well after each addition, until you can easily form patties. Bake for 15 minutes, gently flip each one over and bake another 10 minutes. 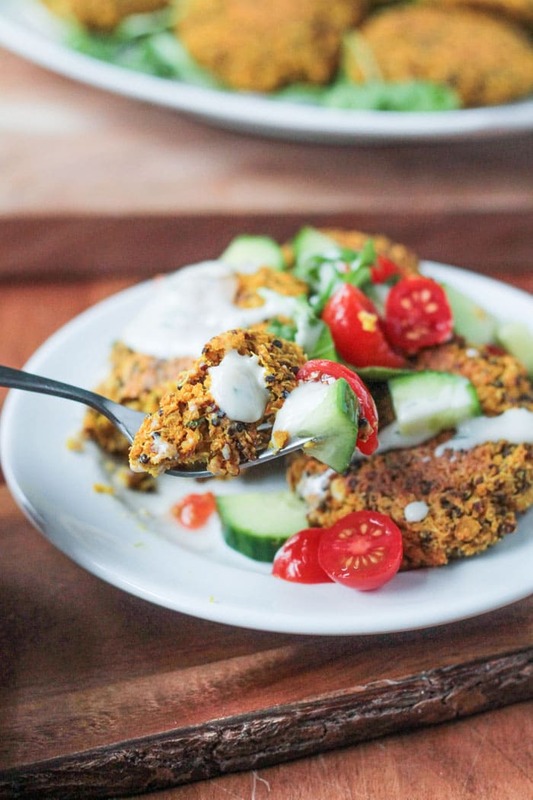 Serve with a simple cucumber tomato salad and Tahini Yogurt Sauce (below). While the Fritters are baking, whisk together all of the ingredients for the sauce. Set in the fridge until ready to use. To save time, you can cook the lentils and quinoa in advance and store them in the fridge until ready to use. I like these patties on the small side - about 2 inches in diameter.You'll get about 20 patties making them this size. Larger patties, like burger size, will work perfectly as well, but obviously you will get less. We used a plain chickpea hummus instead of the tahini as thats what i had in the fridge. It doesn’t say anywhere online that hummus is an alternative for tahini but it worked a treat!! My dad has just started eating lentils and he said these were a winner so I was very pleased. Made enough to have some for lunch the next day as well. And yes the sauce defiantly makes them.. so yum!! Oh, that’s wonderful! Hummus sounds like a perfect sub for tahini – so glad it worked out. Thanks for your comment, Sara! Is it just me or does the instructions not include what to do with the juice of the half of lemon? Sorry! Going to fix it now. Just add it in with the other ingredients when making the fritters. Enjoy! These look great! If you use already cooked quinoa and lentils, what are the quantities? I assume the quantities you show are for dry quinoa and lentils? Hi, Melissa. You’ll need about 4.5 cups of cooked quinoa and about 1 to 1.25 cups of cooked red lentils. Make sure to follow the instructions above to get the right consistency. Enjoy! These sound delicious! I’ll give them a try with my kiddos too! Hope you all love them. Enjoy! These fritters look so yummy! And I love the sauce…so delicious. Looks like another wonderful recipe and that sauce…yum! These fritters sounds so delicious! Love that you haven’t been shy with the turmeric – I’ve been adding turmeric to more of my foods lately, including green smoothies. Thanks, Dreena. I’ve been putting turmeric in everything lately! It started out with a 1/2 tsp in recipes, but now I love it so much, I really pack it in there. And it’s so good for you! A good sauce is always key! Thanks, Alisa! These look heavenly! 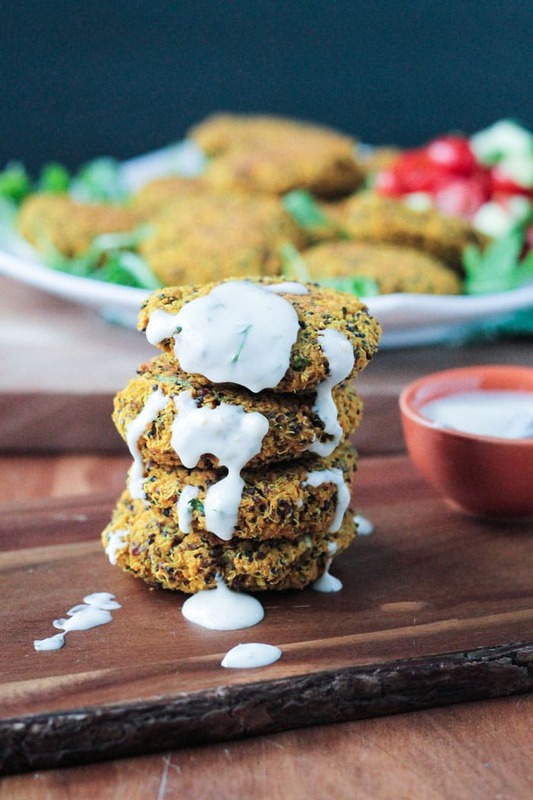 I love that these are baked and uber healthy, And that tahini sauce is calling my name! Thanks, Melissa! Anything with tahini is good, right?! YUM!! I love that you used tri-color quinoa, I think it makes everything look prettier. How awesome that your kiddos approve these – they really do look amazing and crispy! Maybe this is how I can get Willow to eat quinoa again – darn finicky eater ? These are definitely packed with protein, no question there! And that tahini yogurt sauce looks like the perfect addition! I almost always use tri-color quinoa. Tastes the same, but prettier to look at. 🙂 I was a little shocked at how much my kids loved these. Cumin and turmeric are pretty strong flavors, although mild enough in this recipe. Score! I hope Willow likes them too! These fritters look delicious! But what I’m most excited about is that yogurt sauce. I haven’t had anything like that in years! 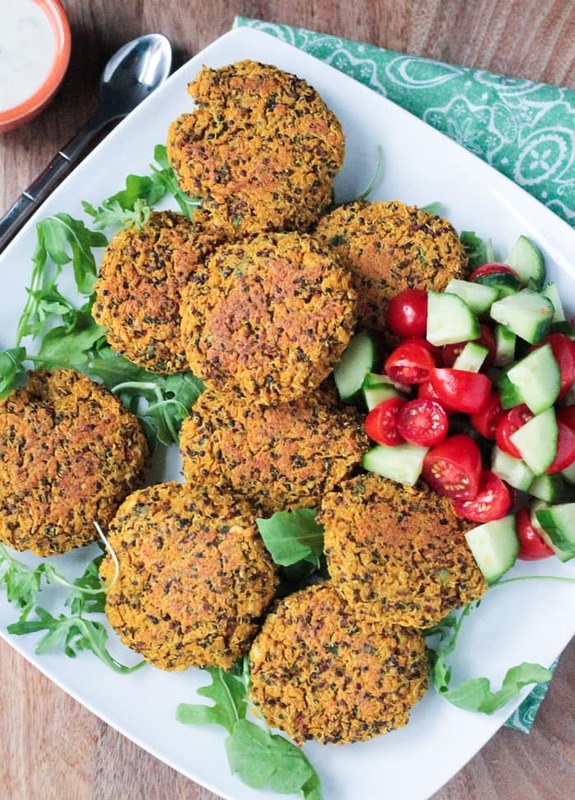 I love fritters and I love lentils so I’m sure I would love these! Especially with that tahini sauce… YUM. I mean, who wouldn’t want crispy fritters with sauce? Duh. 🙂 Thanks, Aimee!! Hi, Stella! Thanks. That is so weird – I think there must just have been a glitch or something. I have floating social share buttons along the right side and the buttons are also at the bottom of the post. Plus, if you hover over any image, a PIN button should appear. Very strange that none of those were working. Anyway, here’s the pin if you want to pin it from here. 🙂 https://www.pinterest.com/pin/128282289366237548/ Enjoy!! That’s so strange. Maybe you need to clear your cache? No matter, glad you got it pinned anyway. Thanks! These look awesome! I’ll have to make them for Darrol. He has been so picky lately, and I’m tired of making the same few things that I know he will eat! My son got super picky once he started school and eating lunch there. The kids were making fun of some of the things in his lunchbox…and I never even sent anything weird…it was things like sugar snap peas and raw broccoli (some of his faves at the time). For awhile he refused to take most any veggies except cucumbers and bell peppers. He’s gotten much better now…he’s in 3rd grade..and even requests salad in his lunch sometimes. But those sugar snap peas he still refuses to take. Makes me so sad because he truly loved them and he won’t even eat them at home anymore. 🙁 Hopefully, Darrol is just going through a phase and it will get better again soon!